Told in an intimate and honest style, I’d Rather Be in Charge is part personal history, part pragmatic guide, as Ms. Beers describes her own experiences, lessons from her peers such as Martha Stewart and Suze Orman, as well as stories of her students’ transformations. By chronicling both successes and mistakes, Charlotte proves that finding your own personal style of leadership is the only way to take charge, find satisfaction, and gain confidence in the ever-evolving workplace of today. As former CEO of the $5.4 billion Ogilvy & Mather advertising agency, former Chairman of the iconic J. Walter Thompson agency and Undersecretary of State for Public Diplomacy under Colin Powell, Charlotte Beers has been shattering glass ceilings throughout her career. Her book, I'd Rather Be In Charge, is not about the past, however, but about the future: how women can succeed at the highest levels of business in today's work environment. According to Beers, women no longer have to prove every minute of every day that they are "worthy of working, able to take responsibility and generate results." But while the "prove it" phase for women in the workplace is over, there is still much progress to be made to overcome residual biases — biases that are expressed today in more covert and subtle ways. As Beers eloquently describes the situation: "The drama of the revolution, when women pioneers were treated like celebrities or freaks, has been replaced by a blurry-edged evolution with little ceilings everywhere, not so high up but more opaque." 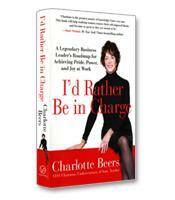 I'd Rather Be In Charge is a guide for women on winning the evolution. The underground nature of the barriers women face today as they reach for higher-level positions is a challenge in itself, writes Beers. The outright refusal to consider women for certain jobs and responsibilities has been replaced by code words or subtle differences in the way women are treated. Beers describes how she heard top managers declare in one meeting that "Sally doesn't own her leadership." Beers understood that this opinion of Sally did not bode well for her future success at the company. And she also believed that Sally would probably never be told directly about her shortcomings, being left instead to wonder why she was not advancing in the company — or why she had lost her position. "Men still feel free to talk to other men, grab them by the collar, and give them a yank, usually in the right direction," Beers writes. "This is the real-life version of mentoring, and it's far less likely to happen with a woman who is equally qualified." To more successfully break through to the upper levels of business, Beers writes, "women need to change how we see ourselves in the world of work, and we need to change the perceptions of those around us, to make our true potential more obvious." 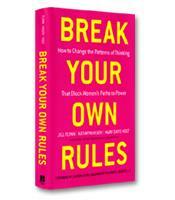 In the first part of her book, Beers focuses on the "personal" — how women must look inward to gain a clearer understanding of who they are, what they want to achieve, and what skills, advantages or hidden "traits" they bring to the workplace. This self-exploration begins with uncovering the family influences or "messages" that women receive in their childhood that can play a profound role in their expectations of themselves and others. "We are taught how to behave," she writes. "We develop responses that become reactions — outward expressions of those early family messages. We also learn by watching others handle various interactions, and those lessons about how to cope become deeply embedded in us." 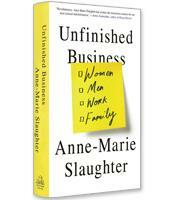 The second half of the book is dedicated to the "public" challenge: helping women change how others see them. Beers urges women to start by engaging in some special "consumer" research — interviewing colleagues and superiors in the workplace to determine, she writes, "if others see in you the qualities you want to be known for." Other chapters in this section cover relationships, communication and when to take the lead. While some readers may not agree with every detail in Beers' characterization of today's work environment, especially in her opening chapter, I'd Rather Be In Charge is an insightful and practical guide for women managers and executives looking to overcome the challenges they face in the workplace. It is strengthened by the author's experiences. Beers has fought her own fearsome battles in a variety of arenas and readers get the benefit without the scars. On the book jacket, Beers is identified as "CEO, Chairman, Undersecretary of State, Teacher." It's clear from this book that she is fully dedicated to this last position, teaching women how to know who they are, how to be seen the way they want to be seen and how to succeed at the highest levels of leadership.